Preheat the oven to 350º F. Grease a 9-inch pie dish with butter. Pour 1 inch of water into a pan, let boil, and then put diced potatoes in a steamer and steam, covered, for 15 minutes. Empty the pot of water and dry it off, then throw the potatoes in and add 2/3 of your cheese (leaving 1/3 of each type of cheese for later sprinkling). Mash it all together with a potato masher. Add 1/4 cup of milk, a scant 1/4 teaspoon of salt, and 1/4 teaspoon of pepper. Mash together and add 1 tablespoon of milk at a time until it's the desired consistency--not at all runny, but smooth. 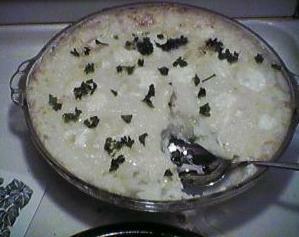 Transfer the potato mix to the prepared dish and sprinkle the remaining cheeses on top. Bake for 20 minutes, uncovered. When removed from oven, sprinkle with the garnishing parsley.